MARY LINCOLN. Signed Book. “Mary Lincoln. 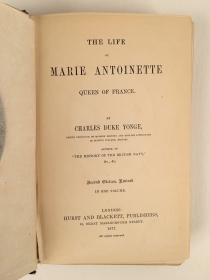 / 1878,” in her copy of Charles Duke Yonge, The Life of Marie Antoinette Queen of France, 2d rev. ed. 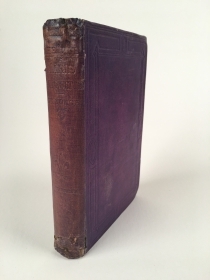 (London: Hurst and Blackett, 1877), xvi, 432 pp., 8vo. 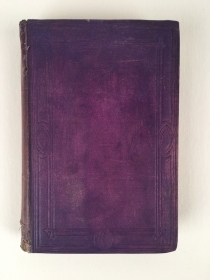 bound in tooled purple cloth boards with titled spine. 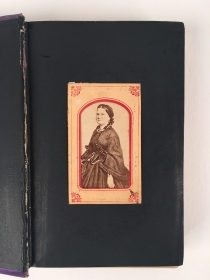 A carte-de-visite portrait of Mary Lincoln has been affixed to the front free endpaper. Mary Lincoln likely identified with the guillotined French queen’s plight. Their words (whether truly said or not) and their intentions were frequent targets of abuse in the press. The press of their respective days viewed both as spendthrifts and harshly questioned their motives, attacking Marie Antoinette’s commitment to the welfare of the French people (“let them eat cake”), and Mary Lincoln’s loyalty to the Union in light of her southern familial ties. Perhaps Mary Lincoln drew comfort and inspiration from Yonge’s closing tribute to his royal subject, quoted above. 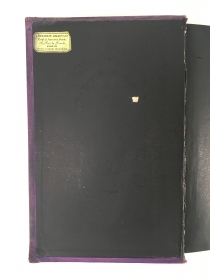 An incredible association copy, acquired and inscribed by Mary Lincoln while she was living in France. Mary Lincoln (1818-1882) was born into the prominent Todd family in Lexington, Kentucky. 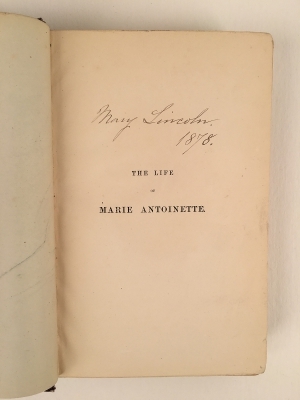 Educated at female academies and boarding schools, she learned to speak French fluently and also studied literature, dance, drama, and music. She was very well-educated for her time, place, and gender. In November 1842, she married Abraham Lincoln in Springfield, Illinois, and they had four sons. She supported her husband’s political ambitions, becoming First Lady in 1861. Because she was from a border state, with several of her relatives supporting the Confederacy, Mary Lincoln was the object of suspicion in the press. Although she was responsible for hosting many social functions, her extensive spending to renovate the White House also drew complaints from a nation at war and from her husband. However, she also visited wounded soldiers in Washington hospitals, taking them fruit and flowers and writing letters home for them. Prone to severe headaches and depression, she suffered the loss of three of her four sons and was present when Abraham Lincoln was assassinated at Ford’s Theatre. After leaving the White House, she lived in Chicago, where her son briefly had her committed to a sanitarium in 1875. After being declared competent to manage her own affairs in 1876, she spent the next four years traveling in Europe and living in Pau, France. She later returned to Springfield, where she died in her sister’s home. Marie Antoinette (1755-1793) was born in Vienna, Austria, the daughter of Francis I, Holy Roman Emperor. She married the future French king Louis XVI (1754-1793) in 1770, when she was just fifteen years old. They had four children between 1778 and 1786. When her husband ascended to the throne in 1774, she became the Queen of France. The young royals came to symbolize all of the excesses of the reviled French monarchy, and she became the target of a great deal of vicious gossip. After the outbreak of the French Revolution in 1789, the government placed the royal family under house arrest in the Tuileries Palace. After the abolition of the monarchy in September 1792, the Convention found the former king guilty of undermining the French Republic and executed him in January 1793. The Revolutionary Tribunal tried Marie Antoinette in October and found her guilty of depleting the treasury, conspiracy against the Republic, and treason. She was sent to the guillotine on October 16, 1793. Charles Duke Yonge (1812-1891) was born in Eton and attended Eton College, Cambridge University, Oxford University, and Keble College. From 1866 to his death, he held a chair of English Literature at Queen’s College, Belfast. He authored a dozen books of history and biography. He translated six works by Cicero, and prepared an English-Latin dictionary and an English-Greek lexicon. Spine cracked with some minor losses and some rubbing at top and bottom, some wear to boards, pages overall clean with a few bearing some marginal loss that has been repaired, else very good.